Last year, when Petey was in the hospital more than he was home, it was a pretty awful time with very few bright points. Our home. For way too long. One thing that saved us and kept us from giving up was the people we met. There was Rocky, an adorable respiratory therapist who always made us smile. Alex and Jason, two of Petey’s surgical intensive care nurses, felt almost like members of the family. Chris took it upon herself to make sure The Kid and I was ok and had everything we needed. To talk about every person that touched us in some way would take way more room than I have here. But Maggie, a health unit coordinator in the SICU, gave us a gift that we continue to enjoy to this day. One day when I was completely exhausted with my meal choices, and dying for a new option, Mags told me about Grace’s Café in Trent Hall (331 Trent Dr, Durham). They serve breakfast, lunch, and dinner, with both classic American, and Asian fare. The food is really good; they make their own noodles from scratch and have duck on the menu, for goodness’ sake. Grace’s is kind of hard to find, but oh my Gawd, so worth looking for. This is the facade of Trent Hall, Grace’s is downstairs. But for The Kid and me, the very best item on the menu is eggplant in garlic sauce. 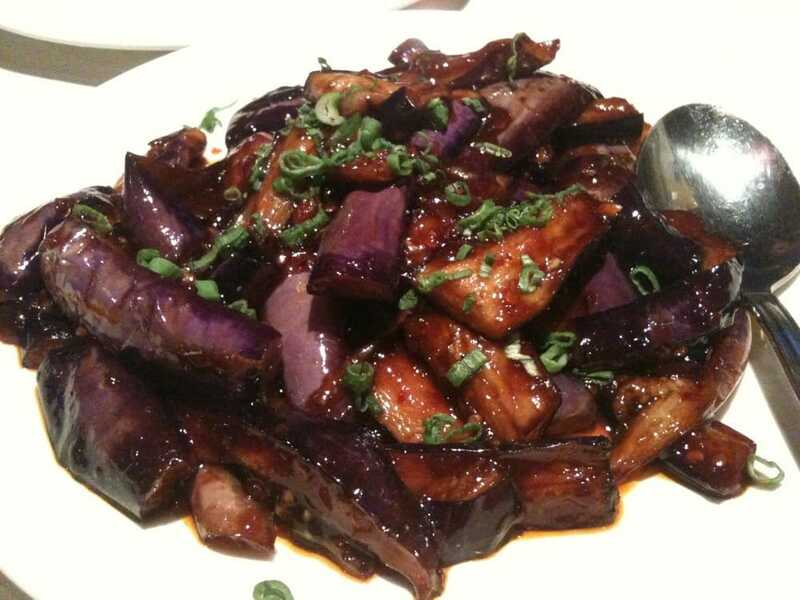 It is the best tasting Chinese eggplant I’ve ever eaten. The sauce is as silky as a French nightgown. Normally a pretty spicy dish, they prepare it for me with no chilies. They also have brown rice, which makes me feel slightly virtuous while I’m pigging out on their amazing food. I love it, and could conceivably eat enough to put me into a coma. Once Petey was released for the final time, we continued to go by Grace’s for take-out occasionally. But because we don’t live terribly close, and it’s not always on the budget, we don’t eat their food as often as we’d like. So when we’re lucky enough to eat Grace’s, I like to get two meals out of each visit. I could order a bunch of other stuff, but I like to economize by preparing my own sides for each night. One night I fix inexpensive steamed dumplings from Fresh Market or Kroger. And for the other dinner, I cook a batch of snow peas. When I prepare the dumplings at home, I make them into pot stickers. And even though it’s a super simple procedure, they’re nicely crispy and taste like they just came from a restaurant. Put water and oil in a non-stick skillet and turn heat to medium-low. Place dumplings into skillet. Cover. When hot (about 5-10 minutes), uncover and turn heat to medium. Allow dumplings to brown and crisp up on one side (another 5-10 minutes). Remove and serve. For the second meal, I prepare yummy quick-cooked snow peas. Add oil to heavy skillet and heat on medium-high. While it’s heating, whisk together slurry ingredients and have ready. When the oil is almost smoking hot, add snow peas and sesame seeds, toss until coated with oil, then lightly season with salt and pepper. Cook until all the peas pods have turned bright green and are hot. Quickly pour in slurry. It should immediately boil. Stir to coat veg. Let cook until the sauce has thickened up. Remove from heat and serve. Just like the band Foreigner sings, with fresh sides each night, “It feels like the first time”. And I’m sure they were talking about Chinese food. Oh yeah, these guys were all about the Chinese food.